For syrup, in a small saucepan, combine the water, sugar, lemon juice, and ginger. Bring to boiling; reduce heat. Simmer, covered, for 5 minutes. Transfer mixture to a small bowl; cool. Chill, covered, in the refrigerator about 1 hour or until cold. 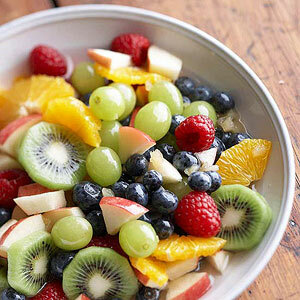 In a large serving bowl, combine desired fruit. Pour chilled syrup over fruit; toss gently to coat. Chill, covered, in the refrigerator for up to 6 hours. To serve, spoon fruit and syrup into dessert dishes. Prepare the syrup mixture. Chill, covered, in the refrigerator for up to 24 hours. Mix chilled syrup with fruit. Chill as directed.